Digilinc wireless Ethernet bridge enables high speed data or video links to be transmitted across distances of up to 20km with line of sight. The system eliminates the costs, disruptions and delays that the laying of hard wire provides. Incorporating 11 Mbps bandwidth and direct sequence spread spectrum technology, a frequency of 5GHz provides powerful, reliable and secure transmissions in assorted weather circumstances. Built around Ethernet technology, Digilinc is very effective in providing a wireless local area network link between commercial and residential communities for telecoms and internet access purposes. The system continues to be developed for the inclusion of Wi-Fi technology. 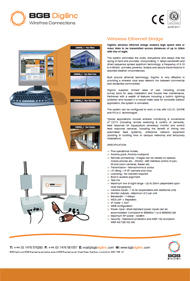 Typical applications include wireless monitoring & surveillance of CCTV (including remote switching & control of cameras), feed response for Aquaculture (including the benefit of a wireless link into automated feed systems), enterprise network expansion (building to building links or campus networks) and temporary installations.